Since "Die Another Day" EON have been increasingly careful to limit the brand's exposure so that it is not diluted or diminished. Bond can define a product but Bond can also be also defined by the product. The Bond brand identity, therefore, has to be protected and is as carefully developed and controlled as any corporate product. The twenty or so brands that were major sponsors of the Brosnan Bond era were pared down to six for the 2006 franchise reboot with Daniel Craig and "Casino Royale". Craig's Bond utilises Sony and Sony Ericsson phones (in part because of the film distribution deal that Sony Pictures took up with "Casino"), Omega watches, Heineken beer, Smirnoff vodka, and Ford with some other associated brands such as Bollinger, Virgin, and Turnbull & Asser. EON and their corporate sponsors are also keenly aware of the how the changing of actors and resonate plotting can influence the brand. Furthermore, the changing geopolitics, cultural shifts, social roles, mores, even male and female identities clearly influence the Bond brand and its commercial ties in. EON's desire to increase Bond's female audience, for example, can be seen in plot lines, casting, and in commercial sponsorship deals with the likes of both L'Oreal beauty products and Revlon cosmetics. The actor chosen to play Bond invariably changes not only the interpretation of the character but also the type of products that can now be associated with the contemporary incarnation of Bond. Craig's Bond was darker, edgier, and more physical. Craig's characterisation pulled heavily on the earlier Bond cannon for style and substance appealing to Bond traditionalists but also needing to also appeal to a younger audience. For the traditionalist, the Walther PPK made a return, Bond drank Smirnoff, and Aston Martin was back with the DBS. Aston Martin's then corporate owner, Ford, paid $35 million to have Bond drive the DBS and secondary vehicles such as the Ford Mondeo (almost unknown in the US but a global best-seller) with other Ford marques of the time, Jaguar and Land Rover, clearly still in the picture. For the younger audience there was Tom Ford clothes, Heineken, and gadgets galore for the digital native audience. Above: Bond borrow's M's Sony laptop to get a trace on the man who hired his deceased bomb maker. The choice of actor and products were part of EON's branding plan. A Bond reboot is always an opportunity to reinvigorate and define the Bond brand. 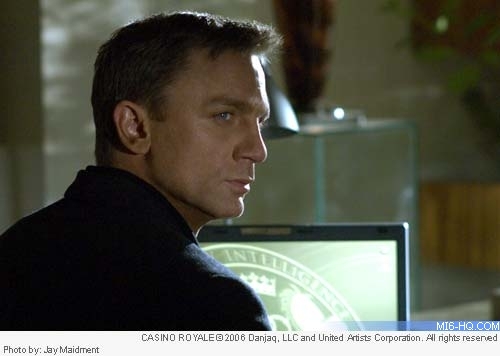 "Casino Royale" was the first film produced after Sony claimed a stake in the Bond franchise and, consequently, Sony products were very much on display with shots of Sony Vaio laptops, Sony Ericsson cell phones, Bravia televisions, and a Cyber-shot camera. But still the product placements did not seem overly contrived as it is not unusual for the Bond movies to feature cutting edge gadgetry. The use of gadgets and technology has always been a trademark of the franchise, but now the films also reflect the increased presence of technology in everyday life. The use of gadgets for self-defence is part of the Bond canon but the integrated use of technology for national surveillance purposes and intelligence purposes rings chilling true after 9/11. Once again, Bond's use of named products adds a sense of verisimilitude to the plots. Technology forms an integral part of 2012 "Skyfall". The movie's villain is, essentially, a non-state cyber terrorist with a global scope, reach, and impact. A villain who is chillingly real. "Skyfall" faced a new challenge. Bond is now one of many action thriller franchises and each film has to fight for its share of the box-office receipts. It is not surprising, therefore, that given the Bond brand and EON's experiences with brand image and product placement that about a third of Skyfall's budget was provided by corporations anxious to appear on screen with 007. Even Daniel Craig recognised the brand's impact and the importance of product placement, telling Vanity Fair: "A movie like this [Skyfall] costs $118 million to make. And it costs another $200 million to sell it. So the $200 million has to come from somewhere. Product placement, whichever way you look at it, whether you like it or you think it's disgusting or whatever, it's what it is. Heineken gave us a ton of money for there to be Heineken in a shot in a bar... Without them, the movie couldn't get sold." It is thought that corporate product placement and commercial endorsements paid for a part in Skyfall are the most ever invested in a single movie. Whether the product has a deep relationship with the character (such as Aston Martin) or whether the brand has a more tenuous connection (Heineken), whether the product is part of an elaborate multi-media cross promotion campaign, or appears only in a subtle camera shot, Bond is a pretty persuasive pitchman. Above: Bond, presumed dead, goes to ground in Turkey and is seen drinking beer on screen for the second time in two consecutive 007 adventures. Bond's product placement formula for screen utilises both high visual, high auditory, and plot tie-ins such as Vesper's enquiry about Bond's watch in "Casino Royale" - all persuasive placement strategies. More recently, there appears a conscious decision to use product placement more naturalistically, and it has been shown that products that are referenced naturalistically enhance the audiences' perception of reality and enhances their brand recall such. The use of incidental props such as the Heineken bottle in "Skyfall" are cases in point. And such product placement clearly works. The non-commercial placement of Reese's Pieces in "ET" increased Reese's sales by 65% in the months after the movie's release, Red Stripe saw its sales jump 50% after appearing in 1993's "The Firm" and sales of Ray-Ban Predator 2 sunglasses tripled after appearing in 1997's "Men in Black". Omega has had a nearly 20-year partnership with Bond, equipping him with a Seamaster wristwatch in every film since "Goldeneye." Omega continue to be satisfied with their relationship with Bond in terms of sales, which peak around a new Bond movie with the Seamaster often selling out. But there's also a lot to be said for the image Bond brings. The Seamaster by extension imbues a sense of Bond's style and glamor, even of adventure and excitement. It's a very positive selling points for men. It's a win-win relationship for the product and for EON. But why is Bond such a persuasive pitchman? Although there are undoubtedly a small percentage of the Bond audience who continue to view the character as a model of masculinity, a much larger percentage aspire to certain aspects of Bond's lifestyle. Many readers and viewers may share the first female M's impression that the superspy is a "sexist, misogynist dinosaur, a relic of the Cold War" yet the collective interpretation of the Bond cultural context continues to be one of taste, refinement, and an aspirational and cultured lifestyle. Cleverly, EON continues to tinker with Bond and his movie scripts so he remains relevant and either leads or reflects the zeitgeist. Product placement has, therefore, helped the relevance and continued significance of Bond as a cultural arbiter. The most long-lived result of the use of branding within the Bond context, however, cannot be measured simply in product sales. Essentially, Bond's greatest impact has been on the broad cultural context which helps push product sales but also transcends them. The Bond brand is more complex than the relationship consumers share with, for example, the golden arches of McDonald's. The Bond brand is more personal, more visceral than one that is linked to a corporate entity for it reflects the perceptions of individuals. To the audience, Bond is courageous, suave, debonair, or he is a misogynist, xenophobic, government assassin. Yet the brand is able to transcend any negative associations and connotations and touch a mass consumer market that continues to have lifestyle aspirations based on the Bond image. The Bond brand, apart from box-office and associated receipts, is not a tangible product. What the corporate endorser and the consumer are interested is in the status, style, and luxury that Bond conveys. Bond's relationship with the audience is complex and nuanced but it's undergirded by innate historical and traditional associations with the Bond image. Audiences respond to Bond in highly personalised ways, yet there are iconic characterisations, and symbols, and motifs that send distinctive messages to a now increasingly globalised audience. The audience, almost regardless of its own culture, or personal level of sophistication, is able to draw on the iconic connection to the Bond image. That image of Bond is so strong that it has been able to weather product placement or promotion that runs counter to some stakeholders brand perceptions. Although the Bond franchise has flirted dangerously with promotions that verge on cheap sales tactics (the on screen Seiko, Seven-Up, and British Airways billboards in 1979's "Moonraker" for example) the experience EON productions has gathered over the last three decades has enabled them to refine their product placements, to generally protect the Bond brand while appealing to consumers. And, the brand does need to be protected for when Bond is associated with a product the connection becomes part of the cultural lexicon that transcends time and contexts. 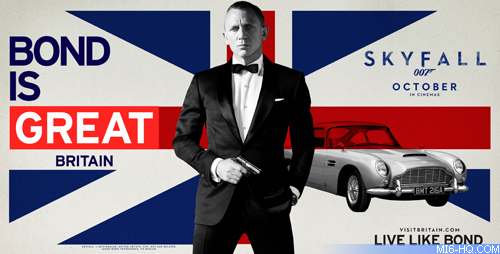 Above: Bond is Great Britain promotional campaign designed to tie into "Skyfall". Justifiably, then, Bond has an established reputation as a vehicle that can create brand image, brand awareness, and sway consumer brand attitudes. But Bond's greatest success as a pitchman isn't for a particular product. Bond's greatest success has been as an ambassador for the United Kingdom. As real British power and influence has declined, Bond's personification of idealised British characteristics and his use of British products has maintained a readily accepted image of a dynamic, important, and powerful Britain, a Britain that continues to punch above its weight. The impact and influence of Bond transcends simply commerce for when people think of the best intelligence agency in the world they think of Bond's MI6. Britain has been branded by Bond and vice versa. It should come as no surprise, therefore, that when a couple of British icons were required to open the 2012 London Olympics they turned to Queen Elizabeth and James Bond. It is debatable, perhaps, as to who was the most recognisable and influential.